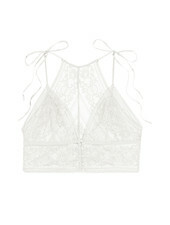 Stella McCartney Lingerie Ophelia Whistling Soft Cup Bra. Luxurious Japanese Leavers lace with a classic linear motif is mixed with touches of silk and pretty lace strap detailing. Stella McCartney Lingerie Ophelia Whistling Bikini Brief. Luxurious Japanese Leavers lace with a classic linear motif is mixed with touches of silk and pretty lace strap detailing. Stella McCartney Lingerie Ophelia Whistling Bodysuit. Luxurious Japanese Leavers lace with a classic linear motif is mixed with touches of silk and pretty lace strap detailing.